RING - SARAH COVENTRY. "NAVAJO" FROM 1973. 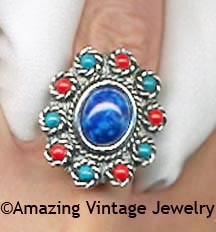 A FEEL OF TRADITIONAL NATIVE-AMERICAN STYLE: ANTIQUE-LOOK SILVERTONE WITH CENTER BLUE MARBLED STONE SURROUNDED BY BLUE, RED, AND TURQUOISE-COLORED CABOCHONS. RING TOP IS 1 1/8" LONG, 1" ACROSS. VERY GOOD CONDITION.